The Osun State Police Command has arraigned a 38-year-old man, Odesola Odedokun, for allegedly attempting to kill his daughter, Mary Odedokun, for money ritual. 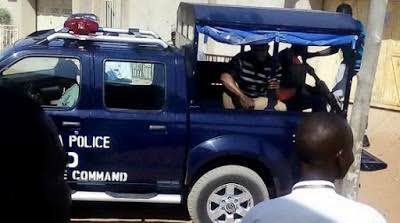 The suspect was docked at Osogbo Magistrate Court alongside two other accused persons on a four-count charge bordering on attempted murder, unlawful possession of charms and fraud allegation levelled against them. The two other accused were Isaac Ajao, 40, and Kazeem Ibrahim, 42. Police prosecutor, Inspector Mustapha Tajudeen, told the court that the accused and others that were still at large committed the offence on March 7, 2018 at about 07:30hrs at Iron community. He explained that Odedokun, the father of the victim and two other suspects conspired to kill one Mary Odedokun with the intention of using her for money ritual. He added that the third accused person, Kazeem Ibrahim, fraudulently obtained the sum of N34,000 from one Mr Isaac Ajao under the guise of using it for money doubling ritual. The prosecutor said the offence was contrary to Sections 320, 418 and punishable under Section 419 of the Criminal Code Cap 34 Volume 11.Laws of Osun State 2002. The Sun reports that the three accused persons pleaded not guilty to the allegations. Defence Counsel, Remigus Ugwu, applied for the bail of the accused in the most liberal terms. Ugwu assured the court that reliable sureties were ready to stand for them. He said they would not jump bail if granted. She said each surety must be a Grade level 15 civil servant and must be resident within the court jurisdiction and produce evidence of three year tax payments. Sodamade added that the sureties must provide three passports sized photographs attached with an affidavit. He added that their addresses must also be verified by the police in charge of the case. She then adjourned the case till April 30 for hearing.